My latest collection is almost designed so I’m in full colour mode at the moment and have already started thinking about the colours I want to use for these new prints. This has led me to a slightly different Fabric Friday this week. When mixing new colours I always do a test print of spots using a very old screen which was one of my first prints. 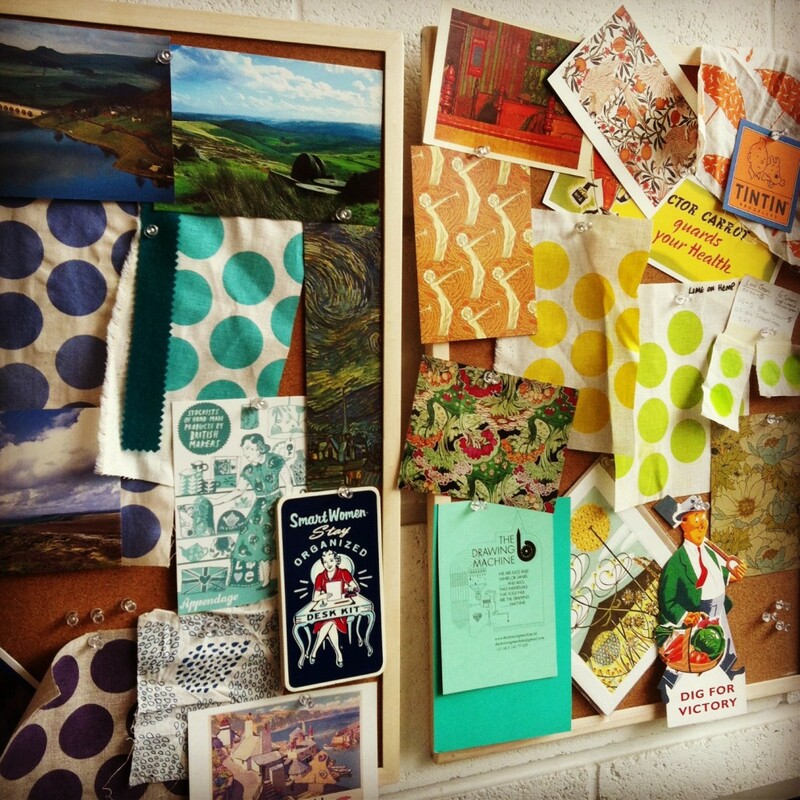 Here on my colour board you can see swatches mixed in with some of my inspiration for various colours. 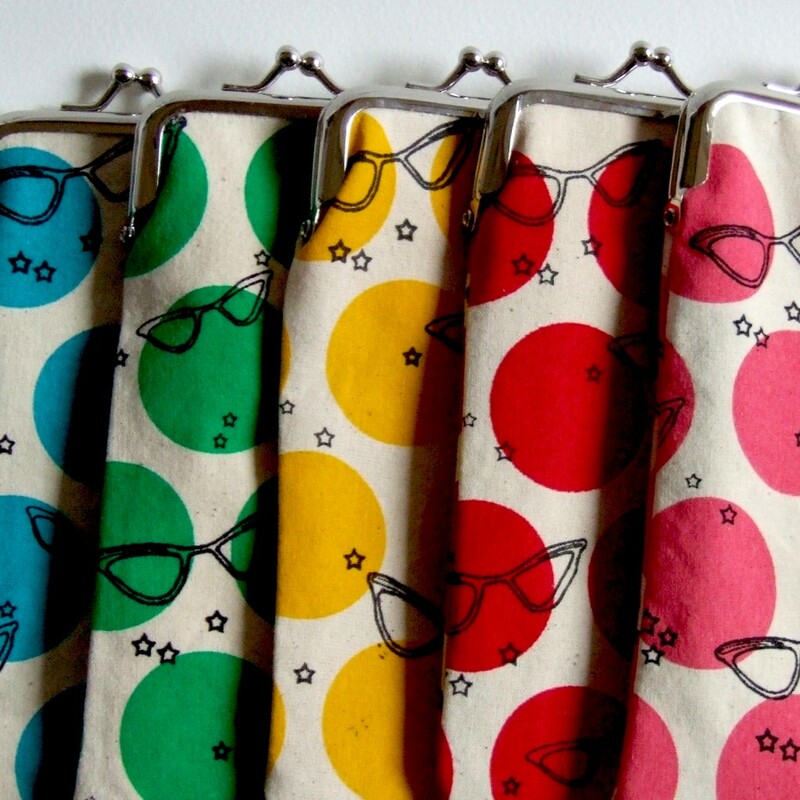 Those of you who have followed me for a while might remember this Fifties Glasses print from back in 2008…. I loved this print as it was the first two colour print I had tried, so being able to use even just part of it to help me with my colour matching is a nice blast from the past. Printing directly on to fabric is very important when trying to create the right colour. I work from some inspirational source material but most of my colour choosing is done on the computer as I mix together palettes and eventually narrow down the selection. Of course this isn’t the ideal situation as all monitors display colours slightly differently due to being based on the RGB model. Once I have my narrowed down selection I start mixing from my base ink pigments using red, blue, yellow to create my colours. I then start printing the inks on test pieces of fabric and usually try this anything from two to five times before I get the colour just right. Colours really start to come alive once they are placed on the fabric, nothing can compare to that so seeing them on the screen is just not the same.